I’m a big fan of capturing moments on film and reliving them just after the fact and years down the road. I have the whole saga of getting married on tape starting with the proposal and on through to the honeymoon (easy, I’m talking about the snorkeling in Maui and the helicopter ride in Kauii). This December a couple of friends and I hit Snowbird for some early season pow and caught it on tape using the Vholdr CountourHD and a GoPro (link). It was a good way to capture some side-by-side comparisons and left us wanting more (powder and side-by-side comparisons). From these tests, one of the most obvious differences was how important field of view is. With a smaller field of view you have to do a much better job of staying focused on the subject your recording (less margin for error). The GoPro did a better job here than the Vholdr. Bitness reviewed the GoPro as far back as 2007 and a few years ago the Vholdr CountourHD. After carrying around a full-sized camera for so many years, unpacking it to shoot, worrying about falling with it or changing the way I rode to accommodate a good shot, well… the helmet cams were an epiphany. Both Vholdr and GoPro have made improvements since our first tests. Vholdr has introduced a GPS version of it’s camera and GoPro greatly improved resolution and introduced myriad mounts and adapters. There are also two new cameras on the market I’m keen to test, the Drift HD170 and the Liquid Image Summit Series. Both are vastly different in appearance than the Vholdr and GoPro and both offer some unique characteristics. 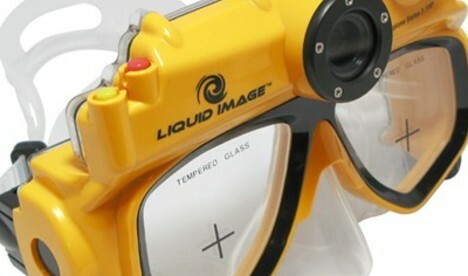 For example, Liquid Image creates a series of cameras in different form factors, for different sports. Rather than adapting the camera to your sport with special mounts, it comes ready-to-go for snow sports (Summit Series), motor sports (Impact Series) and water sports (Scuba, VideoMask, Explorer Series and Freedom Series). The Drift is a durable looking camera and the only one in the lot to include a built-in LCD (GoPro has recently announced their LCD BacPac). The Drift also includes a remote control you can wear on your wrist – very cool since my friend is always asking if his GoPro is on (with the Vholdr it’s easy to know if you’re on or off since the mechanism slides forward for on and back for off). Below is a quick look at what we felt were some of the more important metrics to consider when looking for a ‘helmet’ camera. Bitness is coordinating on a hands-on review of all 4 cameras tested under similar circumstances. Video quality, sound quality, picture quality and ease-of-use will be the focus of those tests. 1080 at 30fps & a “High Action” mode of 720 at 60fps and 12.0 MP interpolated stills. The Liquid Image Summit Series HD is convertible for motocross, snowcross and ATVs. Accessory lenses, tear-offs and nose guard are available for purchase.